Please click here to book an appointment for demonstration of the product. A cloud based web based product for publishers and distributors to manage all aspects of operations. Inventory Management - Manage inventory across warehouses and geographies. What's more, you get analytics which identifies patterns and you never run out of stock. Order Management - Manage all your orders at one place. The full lifecycle of an order right from confirmation, procurement, dispatch and fulfilment can be managed here. You can also sends email updates, sms updates and app notifications to your buyers. Invoicing – You decide the format and the "CORE" generates the invoice. The invoicing module takes care of all the discounts (buyer specific discount), offers and schemes. Account Statements – Historical account statements of all buyers are available on a click. Returns and Credit Notes - CORE manages all your returns and generates credit notes on the fly. Payment Gateway Integration - If the retailer pays via cheque , Great! , simply update the details. If the retailer pays via Prozo Biz (Net Banking or UPI), Awesome!, it automatically gets updated in CORE. Buyers’ profiling - You can administer all your buyers via the User Module in CORE. View the payment pattern, update the contact details, deactivate them, change the credit limits and much more all at one place. Easy Products and Categories Management - You can upload all your products via a simple excel upload. All products are visible to buyers in their prozo biz and you can decide which buyer sees what discount! Do you have a large admin, ordering and finance team to manage your large buyer base? Is it a hassle to take all the buyer order’s on email/whatsapp/call? Not anymore? Prozo biz, mobile app for all types of buyers of a publisher, be it retailer, distributors, school or library. Targeted at both Android and iOS users - This is an HYBRID Mobile Application for business buyers i.e. retailers, distributors libraries and schools. Multilingual App for easy adoption - The application is available in Hindi and English. Other languages can be added on specific request. 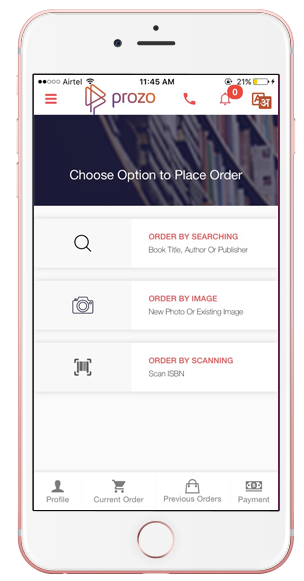 Low bandwidth and innovative ordering feature - This low bandwidth mobile app allows users to place IMAGE Orders in case they do not want to add multiple products through search function. Image order functionality is deeply integrated with Prozo CORE for easy processing of orders. Intelligent, self-learning app - As a SMART mobile app, Prozo Biz advises its users about products which they can potentially sell in their area, most frequently bought items, new relevant launches and much more. Business utility-driven features - Of course, buyers can view all their previous orders details with invoice, their bilty, account statement and payment status of orders. Needless to say, they can share it with others one email, whatsapp etc. Customised features for each Buyer - Prozo Biz app shows customised discounts and schemes to each buyer as per the business association of the buyer with the seller. We believe one size, doesn’t fit all and thus have created a highly customizable app for your buyers. Tired of managing large sales forces and tracking their performance? Prozo brings a niche, customised solution to publishers. Real-time performance management - Sales teams and manager can know about their exact performance on any given day against the targets assigned. Peer-to-peer comparison and benchmarking feature also available. 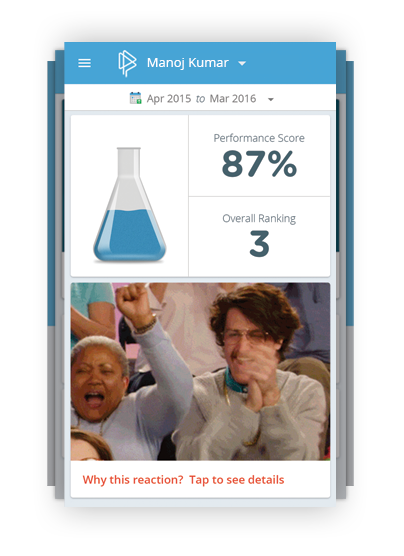 Phone battery saving check-in feature - The sales workforce checks in and checks out whenever he/she visits a place of business interest like school etc. Never miss a follow up - The app would intuitively generate notifications as and when the follow up date approaches. What’s more, you can view the follow ups scheduled for the coming week in the Follow Ups section. Sampling Plan Manager - The admin creates a plan for specific user or a group via a web based console and salesforce follows that plan on the app. Communication panel for buyers - The sales leader can communication with buyers on SMS and email just on click of button for few basic requirements like order status, payment due etc.